v1.45: Changed the DispForm code to fix an issue with picking up the ID of the selected item. Thanks to Dmitry. v1.44: Fixed a bug where the FieldInternalName and not the DisplayName was used as formlabel. v1.43: Fixed a bug (data is not pulled in) in EditForm. This bug is affecting all browsers, but for IE it kicks in only when the lookup columns contains less than 20 items. Look at the bottom of the article for details. v1.41: Added compatibility with DFFS. To achieve this, I have appended the table to the formbody of the lookup column. This to ensure the information is hidden with the field itself when changing tabs or hiding fields by rules. This is an update of a previously posted article. This solution lets you pull in additional information from another list based on a lookup column. It works much in the same way as the SP2010 / 2013 lookup column setting “Add a column to show each of these additional fields” found in the list settings > Change column. The difference is that this one works in NewForm and EditForm as well, where the built-in SharePoint feature only works in DispForm. All the highlighted fields have been pulled in based on the lookup column. Please note that these fields are not stored in the current item, but are shown when viewing the form in NewForm, DispForm or EditForm. I have updated the code to use spjs-utility.js and thus support newer versions of jQuery and browsers other than IE. The only new feature I have added, is support for displaying the information in DispForm. I have NOT changed the function call to ensure backwards compatibility with the older solution. This solution is in fact only tested in SP 2007, but should work for SP2010/2013 as well. Please post any findings below. * "LookupFIN" is the FieldInternalName of the lookup column. The code for the file “PullInformationFromConnectedList.js” can be found here, spjs-utility.js is found here, and jQuery here. The green part is the FieldInternalName of the lookup column, and the red part is the FieldInternalName of the field that the info is pulled from. Great work as always! This is a huge help! Your script populates the associated fields from “List B” in the form. Will the fields in Item X be updated automatically? The default behavior is not to write the values to a filed in the current form, but to dynamically show it when the form is loaded. If you prefer to add the code for storing the valued in this form, then your assumption is correct. Hard as I may try I cannot get the data to show up on my edit form. On my edit form I am using a simple list look-up to select a value that is stored in the Title field in my look-up list. My look-up list also has a multiple line rich text box field. Into the this list I load test case titles and text. What I am trying to do is select the test case titles using the drop down and then show the corresponding test case text using your solution. Just cannot get the text to show up. I am running this on SharePoint 2010 privately hosted by Microsoft (Not Office 365) with your latest versions of SPJS-Utility and jquery-1.10.2.min.js. Without being able to look at what the optHid attribute contains normally it is beyond me to interpret your code. Do you have any ideas what I can look at next? Happy to send you page source. This is fixed in v1.43. Can you verify that it works? It works great in ie 10 and Chrome 31. Thanks so much for spending all the time to help. I use custom names for my edit forms as I build different edit forms for different data views. You hard coded the DispForm.aspx and EditForm.aspx names in your logic on lines 19 and 28. Not a big deal as I updated them in your source, but it would be very nice if you can include an override in “var argumentObj” to pass names if they are different than the defaults. When I am try to get information from a list, I have no results. You are right, I tested this with a link of type “DispForm.aspx?ID=123” and did not think of this. I will add this fix to the code. I have a requirement to Display approvers names in the Editform.aspx depending on a selected category. To achieve this I have set-up a second list with 2 columns, 1 column is for the Category and the second Column displays the approvers for that category. On the 1st list I have a lookup column for the Category column within this list but Out of the box sharepoint won’t let me display the approvers in the EditForm. In the editform.aspx i have added a Content editor and added the below script. I do not get any results. Any thoughts? * “LookupFIN” id the FieldInternalName of the lookup column. Sorry for the late reply. Do you have the CEWP below the form web part? Any errors in the developer console (hit F12 select console)? I see that there is a new version 1.50 that states in the release notes file that you need use this with DFFS you need to place the code in the custom JS section of the DFFS config. Which part of the code needs to be added in there? Is it all of the CEWP content from above except for calling the .js and .css files that are already referenced on the page? the “Unit Price” column is a “Number of 2 decimal places”. How can I get this fixed PLEASE. I have a slightly different use case but I think I might be able to get this to work. – The 2nd list contains over 50,000 items that I would like to be able to display on the 1st list in some cases. I can use DFFS to show/hide the regular fields that I want to see in the 1st list. For that new type of request I would like to have a textbox instead of a lookup to pull in information to display from that 2nd list. Example: User enters in ABC123 it checks list 2 for that value. If that value appears in the Title column then 10 or 15 fields of data are displayed for the user. Do you think that is possible without having to add a Lookup against that 50,000 rows because it takes quite a while to load the form if I do add as a lookup? 10x, great job. I was really missing associated lookup columns in SP2007. Any chance to display the info also in views and not only forms? Please note that the later versions of vLookup will not work in SP2007. I am getting _vti_bin/lists.asmx 500 (Internal Server Error) in browser console. But I can access the lists.asmx directly on the browser? I am using this in SP2013 foundation. Do I need to change anything? Double check the list guid and fieldinternalnames of your fields in the “argumentObj”. This solution in a SharePoint 2013 site doesnt work with the update user experience setting applied. But when the site was at the SP 2010 look & feel works smooth. I’m glad it worked out. I tried the code but I always get a error above the new form web part: “Exception from HRESULT: 0x80131904”. These are the names of all columns in the source list. I Added the delay function, but nothing happens. the error I was getting previously was due to a windows pack. On the edit/new screen the lookup values are not displayed. Here is my script in me editForm…What do I seem to be missing? The function is working properly in edit form. In newform the attributes are displayed but am getting Exception from HRESULT: 0x80131904. Any idea? It might be a problem with the latest version of spjs-utility.js. Try using v1.183 – let me know how it goes. Thank you for the feedback. I have fixed this bug in the latest version of spjs-utility.js. Thank you for this very efficient solution. 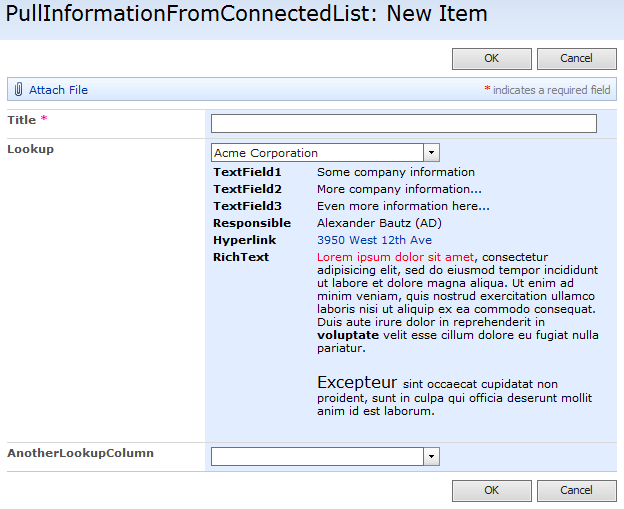 I am trying to use this in SP 2013.I had a question – can this be made to work for a default value of the Lookup Field? I have implemented it in the Edit form and it works fine when I click and select a value from the Dropdown.However,if i were to assign a value to the dropdown programmatically – it doesnt work.Seems like the code works only on the Change of the Dropdown list. Would it be possible for you to help me out? Thank you Alex 🙂 It works fine now. I don’t see where the issue is with AddForm, but while debugging DispForm, it appears that variable ts in init_displayInfo is always undefined. I’m using SP13 in the cloud. If the “init_displayInfo” is undefined, you must check the reference to “PullInformationFromConnectedList.js” in the code. Hi Alex – thanks for the quick response. PullInformationFromConnectedList.js loads fine. I can step through the code and everything seems run. In PullInformationFromConnectedList your comments say it “Must include reference to JQuery and spjs-utility”. Do you mean inside PullInformation…js or someplace else? After a little further digging this morning, it appears that when displayInfo(selID,argObj) is called, selID is undefined. argObj is populated as expected. I’ve looked and looked, but cannot figure it out. Alex – I got it working for DispForm and EditForm, unfortunately I cannot get it working for AddForm. Since there is not an option in displayinfo() for AddForm that is where I think the problem is, but since you’ve said it works for AddForm I figure I must be missing something. I got all three forms (DispForm, EditForm and NewForm) working. I changed one line of code in PullInformationFromConnectedList.js. so that both edit and add run through the same piece of code. I’m hoping this will continue to work fine. If there is any “gotchas” I need to be aware of I’d greatly appreciate letting me know. Anyways, this is GREAT! Thank you for providing a great solution. I’m glad you figured it out. I have not looked at it in detail, but if it works as you expect, I’m sure you are OK.
Hello! I love this but can’t get it to work. Would there be any reason for the code in the script to produce an Failed to Load Resource error in regards to jquery? I can’t seem to get it tow ork and I’ve tried it from a library hosted on our site and from google. * “LookupFIN” is the FieldInternalName of the lookup column. Where Sec_x002e_, Title, Title0, Description all are the internal field names of the list where the data is being pulled from and the other side of | is the name of the fields in the list where the lookup is. Am I missing something Alex? I have not looked at this one in a while, but look at what “Gol4Man” posted above your question and see if this resolves your problems as well. When you pull date fields through, they are displayed in US format (yyyy-mm-dd). Is there anyway to change this to UK format? Trying to implement this in multiple lookup coulmns within a list but no success so far. Does this solution work with multiple columns or is it designed for just one lookup column in a list? I’m actually not sure, but it queries the ID column (which is indexed) so It might work in large lists. It appears as if Microsoft got rid of the “optHid” attribute on their dropdown in the 2013 Cloud version of sharepoint. I had this working perfectly up to the day the upgrade was done. So, because optHid is not there, your code sets your variables (in your code) inpHidID and selID to “undefined”. Beyond this point your code executes without errors, but nothing happens. Sorry had not had time to further debug, but thought this may be useful info. I have a small problem with the browser. The solution works on chrome and firefox but for some reason, on internet explorer (version 11.0.23) the solution doesn’t work anymore. Strange is, that it worked last week. It seems that the problem was that I was using some old version of the scripts. I replaced it with the newest one and that solved the issue. Sorry for taking your time. This is a great tool – thank you for developing it. The only issue i am having is with the NewForm.aspx. When the form loads the addition information does not appear under the dropdown box. However, as soon as i change the selection within the dropdown the additional information is displayed. I have tried this in both IE and Chrome. The easy fix would be to have the field start up as empty in NewForm – forcing the user to make a manual choice in the lookup column. What was the line of code you were suggesting? Sorry, the code missed a closing bracket and ended up invisible.